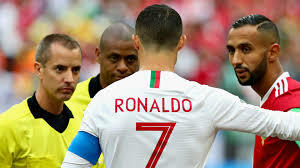 The Portuguese star had already reached a tentative deal with the state prosecutor’s office on the eve of the World Cup and avoided a two-year jail term that was suspended. Ronaldo had been accused of hiding image rights income of more than €150 million from the Spanish tax office between 2011-14 by using shell companies outside Spain. The four counts of tax fraud amounted to €14.7 million but do not involve his salary from his former club Real Madrid. The pact meant Ronaldo could move to Juventus last summer without facing trial or having a jail term hanging over him. He nevertheless had to appear in Madrid’s provincial court to seal the deal. Judges had refused his request to appear by video. Ronaldo spent around 45 minutes in the court building but his hearing lasted only a few minutes. After formally accepting the deal offered by prosecutors, he signed the agreement to pay the fine. The prosecutor also alleged he falsely reported income as coming from real estate, which it said had greatly reduced his tax rate. A custodial sentence would have effectively ended his career but that was unlikely to happen since in Spain, a judge can suspend sentences for two years or less for first-time offenders.